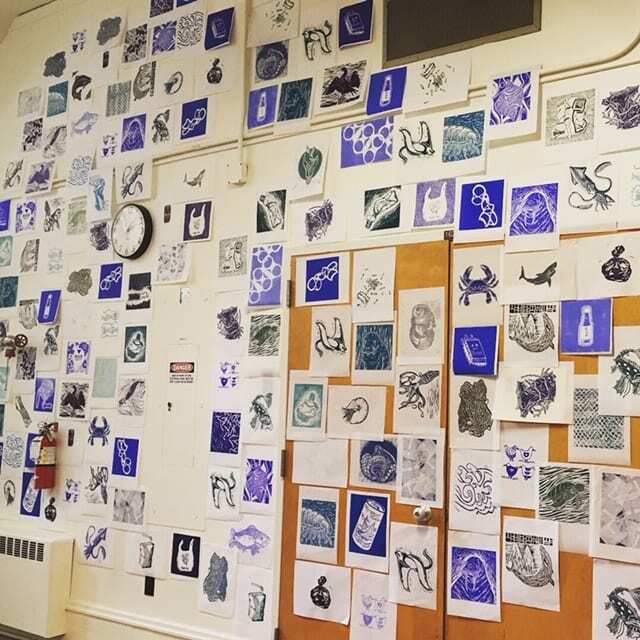 Please come, visit our large scale, site-specific collaborative art installation by Relief Printmaking class. 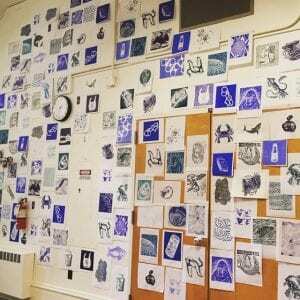 It comprised of over 400 woodcut prints. Take-away prints will be available from our “vending” machine for your donation to a local non-profit, McKenzie River Trust. We hope this project to bring awareness to a huge trash problems in the ocean effecting marine life. It relates to the current exhibit, “Plastic Entanglement” at JSMA. Our “vending machine” appears to sell prints of beautiful sea creatures. However, what the viewer might get is one of the trash-themed prints, just as a fisherman might wind up with a chunk of garbage instead of catching any fish. According to Plastic Pollution Coalition, the oceans will contain more plastic per pound than fish by 2050. The Great Pacific Garbage Patch, a collection of floating trash halfway between Hawaii and California, has now grown to more than 600,000 square miles; that’s twice the size of Texas. We need to approach the problem with a sense of urgency to act now. 27 in EMU Crater Lake North. 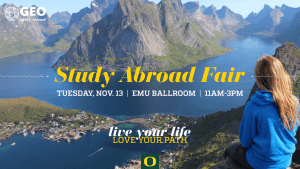 24% of every UO graduating class studies abroad. Internships, field research, and unique program options abound in more than 90 countries. Learn more about internationalizing your education at the GEO Study Abroad Fair: 11/13, 11 am-3 pm, EMU Ballroom. As of August 1, GEO is once again located in 300W Oregon Hall! Join us for this year’s HOPES Conference Theme Reveal tomorrow, Wednesday, 10/31 at 5:15 in Lawrence 231. We’ll get into the Halloween spirit with candy, popcorn and surprises! We presented potential theme titles and explained how each relates to sustainability and design. We then asked you all to vote for the best theme ideas! The watercolor club is an informal gathering for students interested in exploring watercolor – all experience levels welcome and supplies provided! Meets Wednesdays from 6-8 at the Urban Farm across Franklin Blvd east of the Milrace buildings – follow the bike path. If there are any questions contact Sierra (smccomas@uoregon.edu). Receptions for Spring Storm 2018 and Back Alley Bash exhibitions- please join us to celebrate! Spring Storm 2018 showcases the work of over 70 graduating seniors in the School of Art + Design majoring in art, art & technology, and product design. The exhibition will be on view through June 18 from 10:00am-6:00pm. 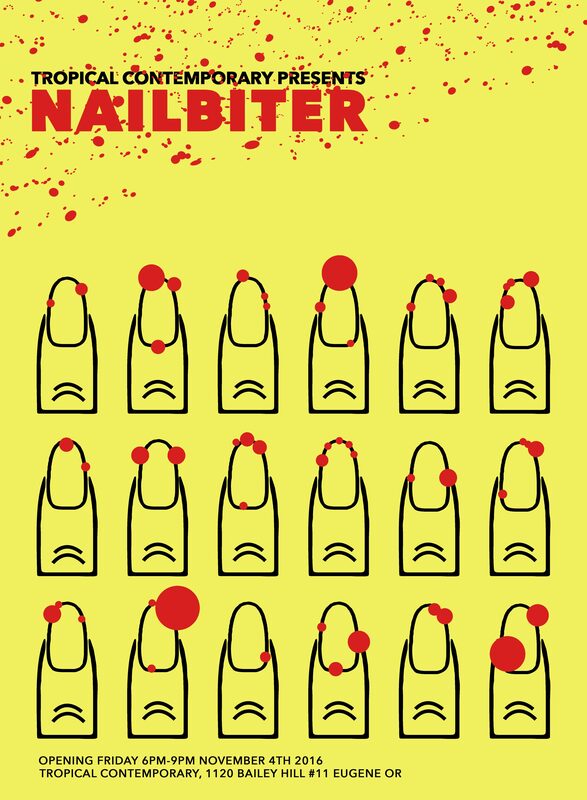 Back Alley Bash presents a culmination of a year’s worth of work from the university’s first Art + Design Academic Residential Community. The exhibition is on view June 6-11 from 10:00am- 6:00pm. Exhibitions are free and open to all. Visit the School of Art + Design for further information about upcoming eventsand the Departments of Art and Product Design. will help us achieve our goal! Thank you so much and please let us know if you have any questions! work in the show represents a wide range of approaches. 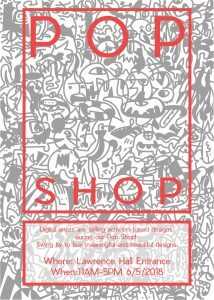 POP SHOP in Lawrence Hall! The Gift Economy project (@gift_economy) started during an experimental sculpture class, Invisible Infrastructures, and acts as the beginning of a continued collaboration between MFA candidates Kayla Thompson and Jen Vaughn. 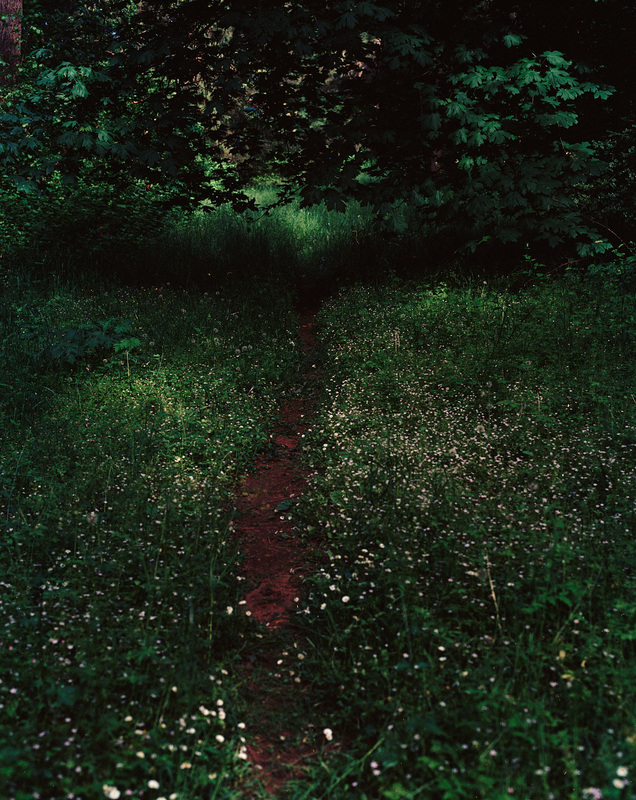 Invisible Infrastructures focuses on the work of Mierle Laderman Ukeles and the nature of maintenance art and work that intervenes within existing systems. 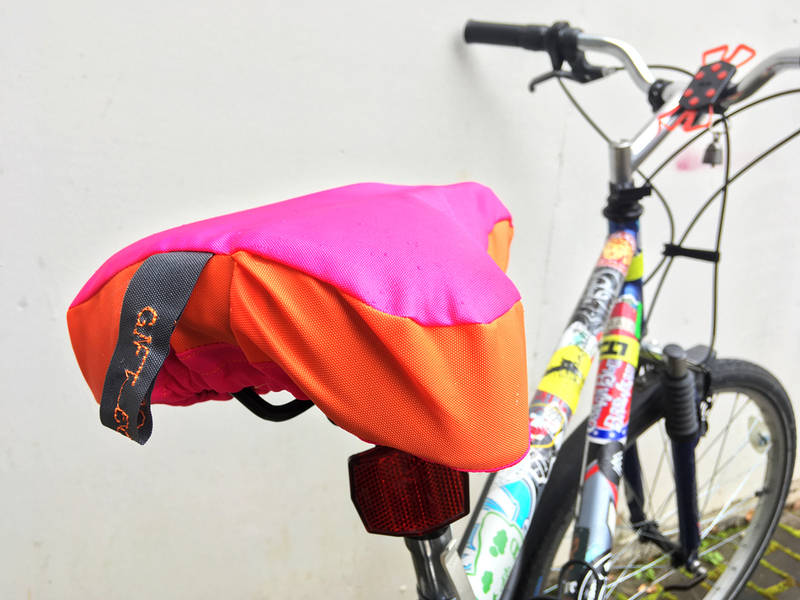 For Thompson and Vaughn the hundreds of handmade bicycle seat covers serve as a small gift and act of care for fellow bike commuters braving winter weather. The creative intervention and colorful flash mob of objects highlights possibilities of positivity and communal well being. Follow the collaboration or share your own on Instagram @gift_economy. Please join us for our first meeting of winter term Wednesday, 1/17, from 5:15PM – 6:15PM in EMU 231aka the Cedar Room! Our meetings from week 3 (1/24) and on will take place in Lawrence 286. We have a ton of updates that we are excited to share about speakers, branding, and special events. I’ve attached a floor plan of the EMU 2nd floor so you can all find your way! 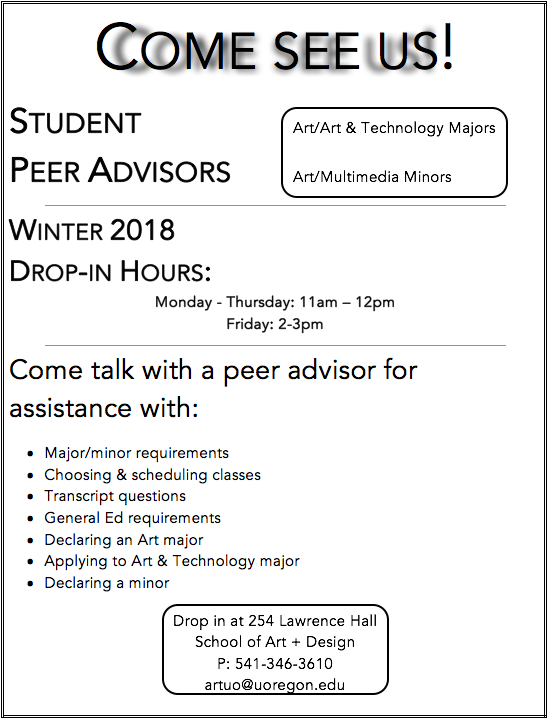 Peer advisors will be available during Winter term at 254 Lawrence Hall on Monday – Thursday from 11am-12pm and Fridays from 2-3pm. Come visit us! topics from last week’s brainstorm. There will be cookies and tea! http://hopes.uoregon.edu for past events and general info. I hope everyone got a chance to enjoy the HOPES conference last month! Although HOPES is over we’d like to start setting up a team for next year. Elections will be held for leadership positions in the next couple weeks. Leadership positions include Branding Director, Outreach Director, Logistics Director, and Speakers Director. We will also need to fill positions such as social media lead, web designer, and graffiti team. All positions and their responsibilities will be explained tomorrow at our final meeting of the year. If you loved the HOPES conference and are interested in getting involved please join us tomorrow Wednesday. 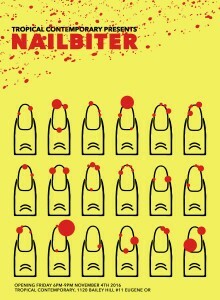 May 17th at 5pm in LA 206. *You will have one week to submit your interest for these leadership positions (until May 23), and we will evaluate and elect a team for HOPES  shortly after. If you cannot make tomorrow’s meeting but would like more information, please email me or Julia Frost at jfrost2@uoregon.edu. 9-5 weekdays located at the Fertilab Space: 44 W 7th Ave, Eugene, OR 97401. First Friday Art Walk: Friday, January 6, 2017, 5:30 – 8 p.m. Formal Artist Reception: Friday, January 13, 2017, 6 – 8 p.m.
Student Panel Discussion: Tuesday, February 7, 2017, 7 p.m.
that artists face in a contemporary setting. within the academic and artistic community at the University of Oregon. Art Department Fall 2017 Scholarships APPLY NOW! Current* Art and Digital Arts/Art & Technology majors are eligible to apply. The deadline to submit Scholarship Applications has been extended to Tuesday, January 31, 2017 at midnight. Applicants are encouraged to submit their FAFSA as soon as possible prior to the January 18, 2017 deadline. *Current majors are those whose application/declaration was confirmed by the Art Office before December 1, 2016.
and local artists who wanted to create an event that exposes local and regional talent through print media, ephemera, comics, illustrations, storytelling and many other graphic and visual arts. We would like to continue to grow this event in scale and complexity and will continue to reach out to artists in other cities large and small to showcase their talent. We believe a zine fest in Eugene was a long time coming and wish to get the word out to support the artists who have taken a chance on our emerging event. fleshy sacrifices to help channel our focus. This behavior we pass down socially, learning from our loved ones who cope in this same way. sculpture, photography, and video, Tropical presents a show that looks at this relationship of behavior and stress, venturing into the creepy, grotesque, and abject. 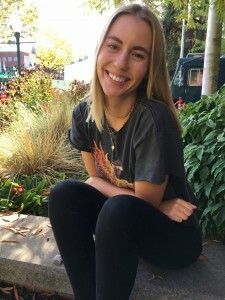 of emerging artists in Eugene, Oregon who are working to instill a climate of contemporary discourse, critique, and unbridled creation by finding ways to connect through visual, acutely visceral, and symbolic means. Lawrence I enjoy working with the UO students in other communities, such as the Clark Honors College and the University Housing. I find human interaction to be a fascinating thing and often look upon it as the inspiration for my work. As I enter a new year of exploration and growth, I look forward to meeting and learning with every one of you. 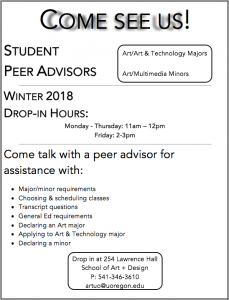 Please drop by the Art Office at 198 Lawrence Hall during these hours if you want to meet with a peer advisor. 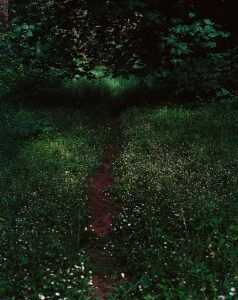 Eugene Contemporary Art announces the exhibition, Layers that Swallow, featuring work by Mandy Hampton. On view at The Barn Light East, M-F 8-6, October 1 through October 28, 2016. 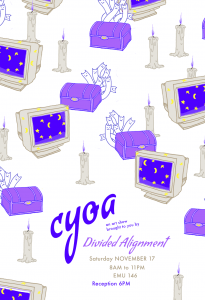 The 2016 UO Art MFA Thesis Exhibition opens Friday, May 6, at Disjecta Contemporary Art Center, 8371 North Interstate Avenue in Portland, with a reception from 6-9 p.m. The exhibition runs through May 29. Exhibiting artists are Anya Dikareva, Summer Gray, Krista Heinitz, Steven Joshlin, Daniel Lopez, Sarah Mikenis, Rachel Widomski, and Stephen Nachtigall. Video, digital media, collage, performance, painting, sculpture, printed matter, photography, and installation make up the range of practices presented in the exhibition. “The broad range of inquiry and practice demonstrates the dynamic conceptual and formal potentials of this graduating group of young artists,” Michlig notes. 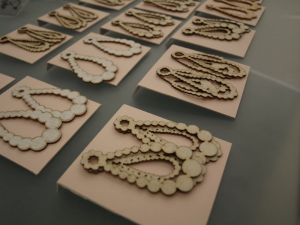 Her materials and processes vary widely, as has the direction of her creative inquiry since she began graduate school. Some are made in plywood covered with upholstery foam and canvas; others are made from digital drawings translated into oil or acrylic paint and airbrushed. She characterizes her show installation as a synthesis of the trajectory of her work over the past three years — from photo-realism to abstraction, from making collages to be painted, and finally to “paintings that become sculptural objects themselves.” Though her work has changed dramatically, certain themes — like the human body, fashion, consumerism, pattern, and disruption — have remained, she says. Stephen Nachtigall also departs from traditional two-dimensional work, however his installation is based around digital videos made with 3D models of plants and animation software. The videos are shown on flatscreen televisions incorporated into a structure built with steel studs. His work also integrates printed mesh screens and other materials as the “walls” of the space. 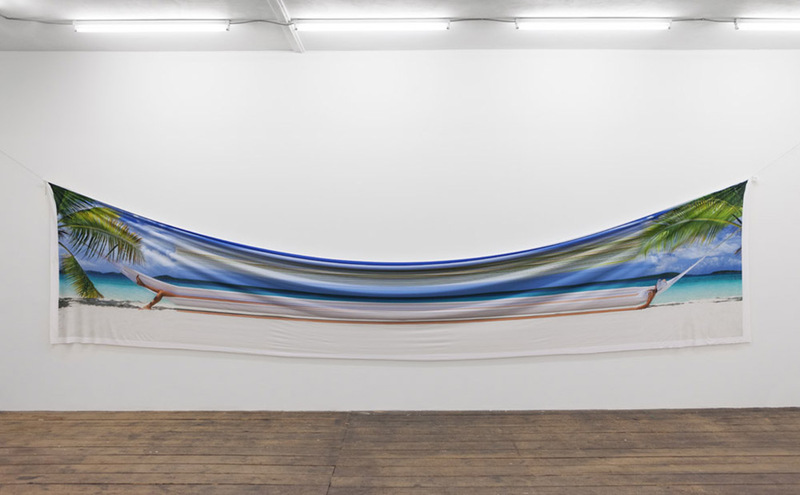 “The result is a provisional structure that viewers can look through and also pass through physically,” he says. Nachtigall says the work is a new direction for him at the same time “a kind of summation” of his studies at UO. Disjecta is open Friday through Sunday from noon to 5 p.m. when exhibitions are staged; in between shows, the gallery is closed. 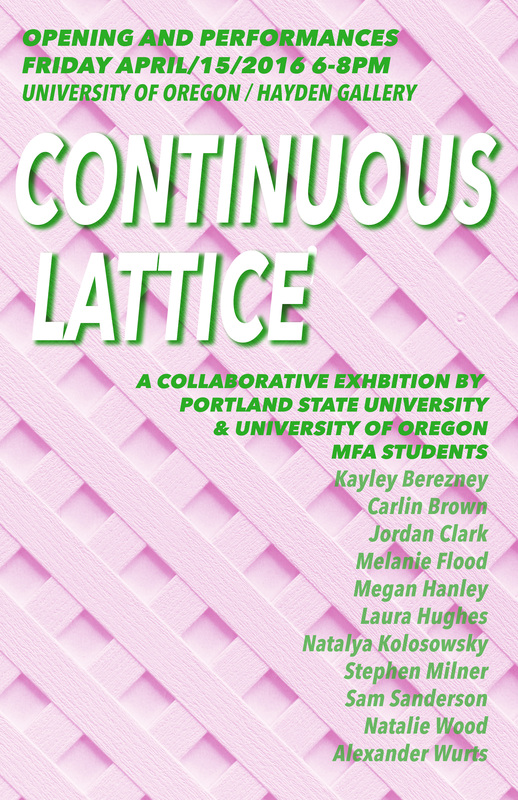 Continuous Lattice is a collaborative exhibition with works by the MFA candidates of Portland State University and the University of Oregon. It developed out of visits and discussions between the first-year graduate students at each school. The work exhibited is diverse in medium, technique, and concept that represent the individual practices of each artist. While the pieces vary, they are united by desires to connect and seek solidarity. 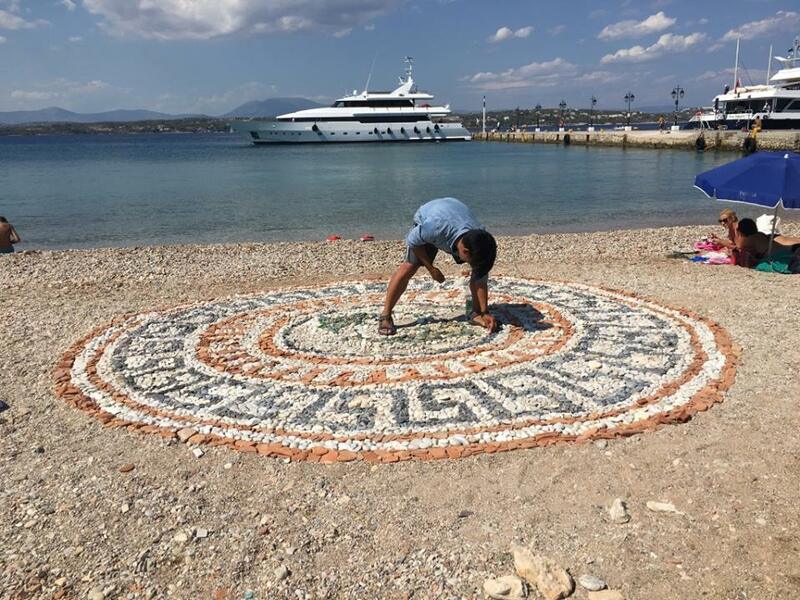 The show is an opportunity the artists to build a community – bridging the gap between two programs, geographical distances, and artistic processes. There will be an opening reception Friday, April 15th from 6-8pm with performances scheduled to start at 6pm to continue intermittently throughout the duration of the opening. 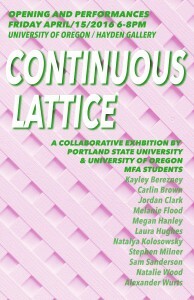 The Wallace and Grace Hayden Gallery will host Continuous Lattice through May 14. We invite all to attend and connect with this community. Guest talk by Cammy Davis at 6:30, with free food and live music! Congratulations to Ditch Projects for being a recipient of a 2015 Precipice Fund Grant! Dani Lopez, Drawing and Painting BFA, invites you to her show, I NEVER LEARN, at the Washburn Gallery on January 4th, 5-7pm. She is showing a collection of work that includes weaving, painting and sculpture. January 7, 2016 | 5:00 p.m.-7:00 p.m.
White Box at the University of Oregon School of Architecture and Allied Arts in Portland is pleased to present 2016 UO Art MFA 2nd Year Exhibition. On display will be the work of nine master of fine arts graduate students in their second year of candidacy. 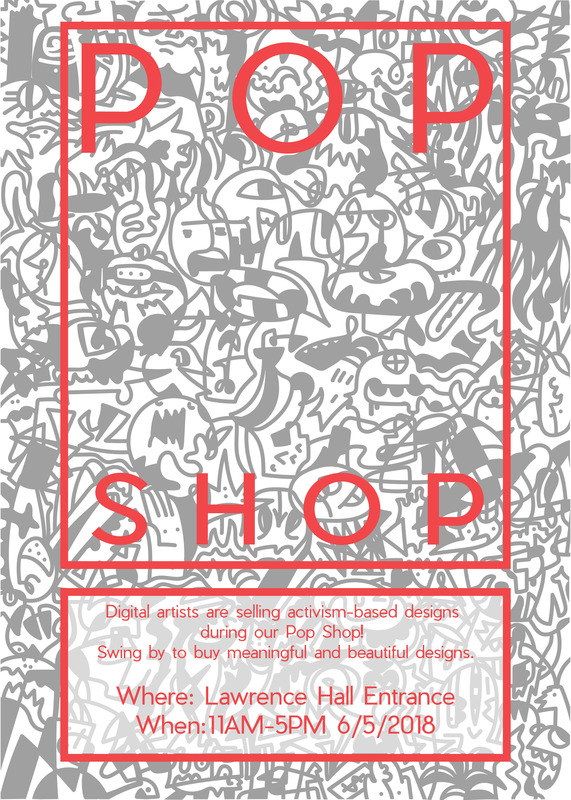 Hours: Tuesday – Saturday | noon-6:00 p.m. 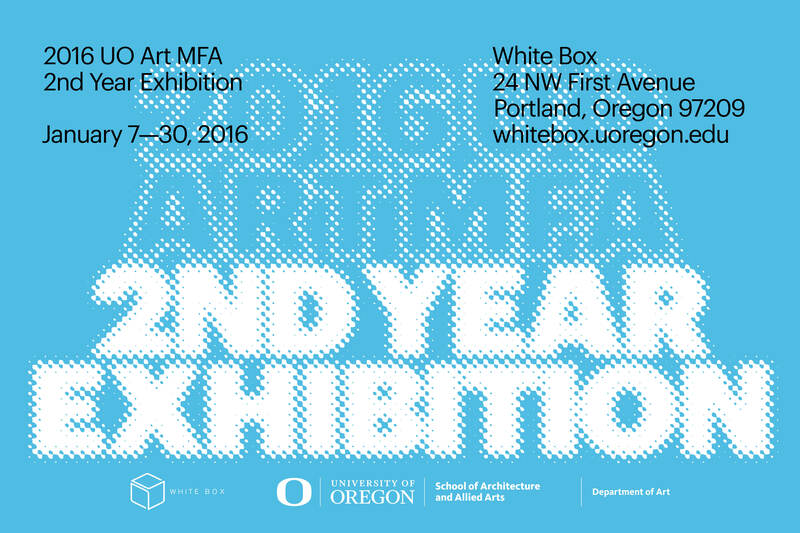 The 2016 UO Art MFA 2nd Year Exhibition presents the work of nine MFA students in their 2nd year of Candidacy. The Department of Art MFA is an interdisciplinary program in which students are encouraged to work across disciplines, with focus in areas of sculpture, photography, painting, printmaking, digital arts, ceramics, fibers, and jewelry & metalsmithing. The curriculum combines disciplinary depth and interdisciplinary thinking, and students work closely with faculty members from every media area through graduate reviews, independent studies, and interdisciplinary courses. 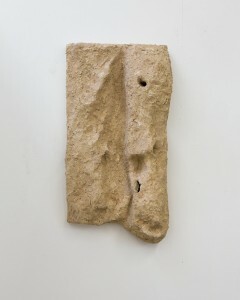 If there is a common thread running through the work of these artists, it is that each refuses expected responses to subject-object relationships, and each artist mediates these relationships vis-à-vis surprising and experimental processes and use of materials, often conveying the aspiration of one medium through the voice of another, sometimes returning again and again to the same idea with widely varying responses. Collage, video, ceramics, drawing, sculptural bricolage, puppetry and painting are all presented under an umbrella of exploration whose imperative seems to be a continual upending of viewer expectation. 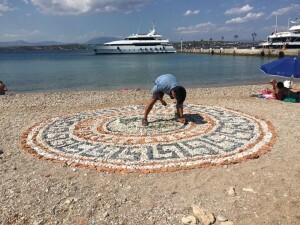 There is a momentum in each artist’s practice, represented in this exhibition by works that index highly discursive and energetic artistic activity, hinting at both the temporal nature of an artist’s labor, as well as the enduring visual and conceptual momentum that occurs as the result. The MFA program is a three-year period of rigorous studio investigation, critical discourse, and conceptual development. Emphasis is placed on developing a course of study tailored to the needs of the individual student, while encouraging exploration and risk-taking. 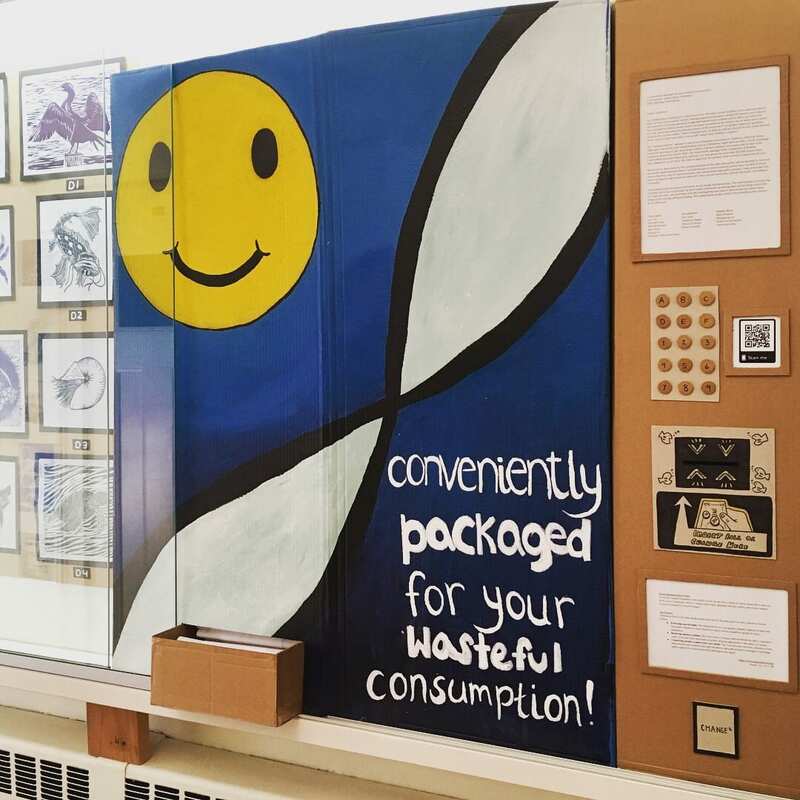 The program supports a thorough engagement with the processes and principles that are fundamental to each student’s discipline, as well as an informed awareness of issues and practices within the larger art community. Developing fluency in critical discourse, analysis, and writing are important parts of the MFA program, which culminates in a yearlong terminal project and group Thesis exhibition. This exhibition is made possible in part by the Ballinger Family Memorial Fund. Part 2 of the 20th ANNUAL Jewelry Sale will be held at MODERN (207 E. 5th Ave in Eugene) from 6-8pm on Friday, December 4th! 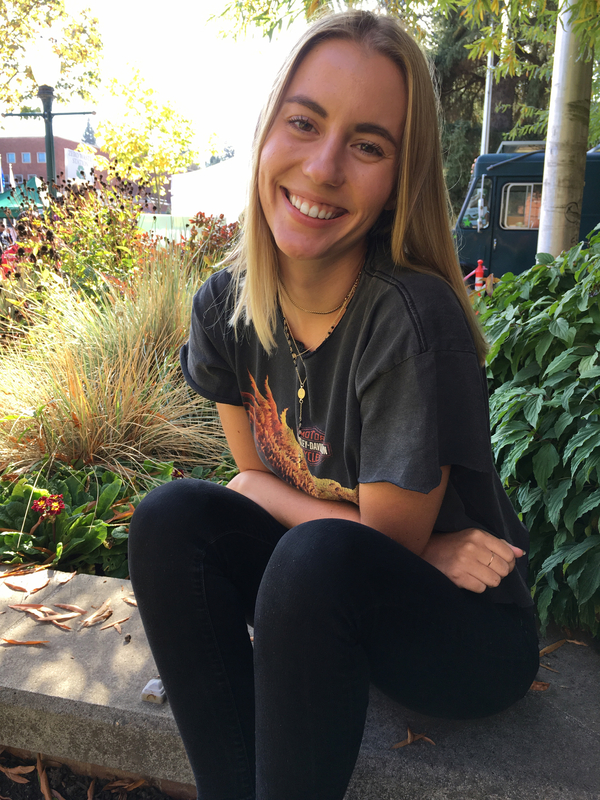 As part of the First Friday ArtWalk, students and alumni of the Jewelry & Metalsmithing program in the Department of Art will present jewelry that is inventive and thoughtful. Each student is responsible for the design and fabrication of 3-5 pieces of jewelry including rings, pendants, brooches, earrings, etc. All pieces will be priced between $20 – $100 in order to raise funding for guest lectures, seminars and studio equipment. The sale has enjoyed immense success in past years. Be sure to mark your calendar!